The Case Grandson's First Knife Mini Trapper with yellow synthetic scales is a great gift for any young man. Tru-Sharp surgical stainless steel clip point blade and spey blades provide plenty of versatility for your daily cutting tasks and are etched with "Grandsons's First Knife". Synthetic yellow scales are a light yellow hue with a oval inlayed Case medallion. 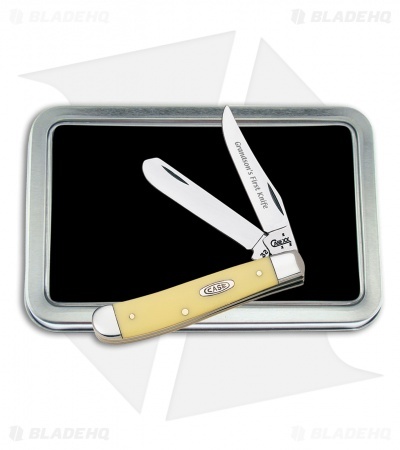 Polished nickel silver bolsters with brass pinned construction ensures years of reliable use.